How she got connected to food: During Garner’s work with Save the Children she witnessed first-hand the struggles mothers living in poverty across the US face when trying to provide their children with a healthy, strong start in life. Emboldened by that experience, Garner joined up with John Foraker, a natural-food-industry veteran and former CEO of Annie’s, to co-found Once Upon A Farm, an #organic, fresh #baby food company. How it works: Based in Berkeley, California, Once Upon a Farm provides nutritious “farm-to-family” foods to kids of all ages. Their mission is to give as many children as possible the best tasting, most nutritious, and highest quality food using only sustainable and organic methods. 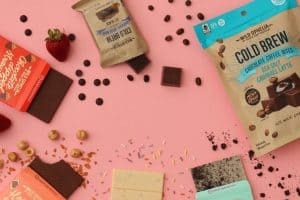 The company currently offers a line of baby foods and applesauces whose ingredients come from certified organic farms with no added sugars, preservatives, pre-processed purees, or concentrates, and all of their products, in addition to being certified organic, are non-GMO, kosher and gluten-free. They use cold-pressure to lock in nutrients and flavors. Over the last year, Once Upon A Farm has expanded from 300 to 8,500 retail locations including Publix, Walmart and more. They also offer a subscription program that allows customers to have homemade quality food delivered to their home on a schedule that works for their family. In addition to making healthier baby food available on shelves and online, the company’s founders also want to ensure that it is more accessible to families of all income-levels by making it available to people on WIC.And on March 5, 2019, the they announced that Once Upon A Farm has been WIC-approved in Florida and West Virginia, feeding almost 125,000 babies born into poverty.